Its been another busy Thursday starting off very early today for my youngest to catch a ride at 7am to an interschool Netball carnival. Our girls were a junior team up against older and more experienced senior teams, so you can imagine, it didn't end well, but they did gain valuable experience. I then had to come back home to pick up my older daughter, run her to school then have my Physio appointment for my ongoing shoulder problem, have a short stint at home before picking up eldest again who has a short day at school on Thursdays and then back again at the end of the school day for the youngest. Always on the run, lol. It was a wonder I got anything done here today, but I have been trying because I have a small card class at home here tomorrow. Thank goodness I had a card already prepared for today's post. Come and have a look. Its Wednesday once again, and that means its time to play at the Paper Craft Crew. Here's our sketch for this weeks challenge. I'm using the stamp set Sheltering Tree today. I haven't inked it in a while so it makes a change for me. I thought I would make a masculine card with the set, combined with the In Colour Paper stack and card of Tip Top Taupe, Crisp Cucumber and Whisper White. The greeting actually comes from the stamp set From the Herd. Inks used on this card were Soft Suede, Crisp Cucumber, Island Indigo and Memento Black. We hope you will join us this week at the Paper Craft Crew for this challenge. We can't wait to see what you create. I've been missing from the action for a couple of days while we sorted out my Daughter's bedroom, new bed, new carpet and a touch up of the paint. Then new quilt and cover and the room is really starting to come together and look good. The purple carpet is soooo nice. I love it too. I will post photos once its all arranged to her satisfaction. I've had no time to create except to make sure I had my Design Team card done for this weeks challenge. 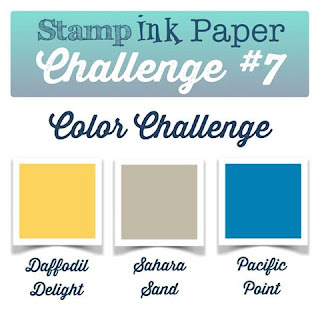 Here is the challenge details for this weeks Stamp Ink Paper challenge. Its a colour challenge as below. This was an interesting colour combination for me and I was tempted to do a Baby Boy card, but in the end I went with a Floral design combining Flower Patch, Papillon Potpourri and Wood Panel background stamps. I hope you are having a fantastic weekend so far. My Saturday has been pretty busy. We are getting new carpet in my daughter's bedroom on Monday, so everything from the room needed to come out which we did. Tomorrow I have some more cleaning to do and a bit of touch up painting as well. Today's card was a simple one featuring layered butterflies and one of the Fun Frames which I had sitting waiting on my desk for a suitable project. The cardstock I've used is Rich Razzleberry, Bermuda Bay, Very Vanilla and Delightful Dijon. I added a strip of Bohemian designer paper to the base card. The framelits used were Butterfly thinlits and Bold Butterflies. The greeting comes from the set Six Sided sampler. Thank you for calling in today to see my card. See you again tomorrow. I hope you've had a great Friday. I've had my youngest home with me today because she had some teeth pulled yesterday by the request of her Orthodontist. Not fun, but she has coped pretty well. There is no basketball tonight, thankfully, as I don't think she would have been able to play. Today's card features the Kinda Eclectic stamp set which I've combined with Lots of Labels framelits and Well Scripted greeting. Come and have a look. There are butterflies in this stamp set in 2 sizes and I've used both on this card. The Cardstock I've used is Whisper White and Crumb Cake, and the inks are Mossy Meadow and Hello Honey. Here's the full photo of the card below. I hope you like this one. Thanks so much for stopping by today. Please feel free to leave me a comment. I love hearing from you. Have a great Friday. Today I've used the vintage set Rev up the Fun again for another male card combined with some bits off my desk. I love when I can be productive and actually use something older from my stash and the patterned paper on this card from the Moolight Paper stack has been sitting there for months. I actually had the panel stuck onto the Lost Lagoon square base for some time and had no inspiration as to what else I was putting on the card until yesterday.. While I had the Rev up the Fun stamp set handing for the Paper Craft Crew team card I actually stamped the car image onto Whisper White and cut it out with the Lots of Labels framelits and also stamped the Joy Ride greeting directly onto the card. Come and see. I've stamped with Lost Lagoon and Crumb Cake ink onto the Whisper White. That label is raised on dimentionals. 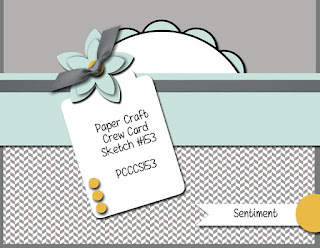 Welcome to the Wednesday card sketch challenge for this week at the Paper Craft Crew. I wanted to use the Kinda Eclectic stamp set today and decided I would make a masculine card by combining it with Rev up the Fun which is an oldie (vintage) but a goodie. The cardstock used is Whisper White, Basic Blac and Hello Honey. I changed it up just a little from the original sketch with the greeting placed horizontally below rather than the little tag and my Sun from Kinda eclectic stamp set depicts the semi-circle from the sketch. The patterned paper is from the Back to Black pack and I've used the Decorative Label punch for the greeting. 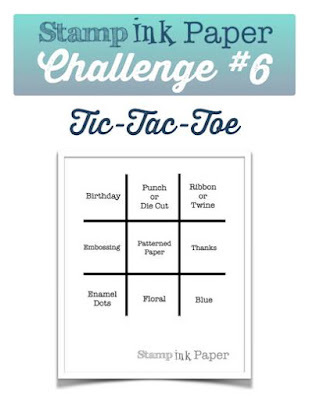 We hope you will join us at the Paper Craft Crew for our challenge this week with a card of your own. Have a great day. Welcome to another Stamp Ink Paper challenge. This week our challenge comes from Sandy. You decide which line you would like to use for your project. I decided for me, it would by quick and easy to go with the top row horizontally. "Birthday, Punch or Die Cut & Ribbon or Twine". Come and see what I made today, a Gatefold Framed Butterfly card. The cardstock used is Blackberry Bliss, Bermuda Bay, Very Vanilla, and Basic Black. The patterned paper comes from the Mosaic Designer pack. Here's a closer look. The dies used are Butterfly thinlits, Bold Butterfly, Deco Label and Banner framelits. They cover the Die cut or punch element of my Tic Tac Toe line. I've added Ribbon tails and a bow to the side of the Deco frame to cover the ribbon element. How was your weekend? Mine was a busy one with the girls and I'm looking forward to some warmer weather this week after the cold of the last week. Today's card uses up some retired paper from a stack called Adventure Bound. This is a simple card using shells from the By the Tide stamp set. Come and have a look at them. The cardstock used is Tip Top Taupe and Very Vanilla. The shells were stamped onto more Very Vanilla card and handcut. The greeting comes from the set Teeny Tiny Sentiments and was cut with the Bitty Banners framelits. Here's the full view of the card. Thanks so much for calling in to see today's card. Have a great day. It's turned into a dreary wet and cool evening here with more rain predicted over the new few days. I'm trying to look on the positive side, which means I won't have to water the garden with all the new plants we've planted over the last couple of weeks, bonus! Its been a stressful afternoon as Sundays now seem to be the best time on the roads for a learner driver and guess whose job it is to go driving with my daughter. We did a full hour this afternoon, before it got too wet. Its a start. Today I finally finished off a half made butterfly which was stamped with the Floral Wings Hostess stamp set. I wanted to do the 3d effect with the flowers raised on top and now I'm happy with the finished butterfly. Enough so to finish off the whole card and show you. How's your Saturday going? Its been another freezing cold day here on the coast with temps well below our average for this time of year. They even had snow out west, which was pretty amazing and dreadfully cold I'm told, but also good to experience for the young ones. Its a pretty rare sight in those parts of Queensland. Today I'm back with a Butterfly card and the jewel shades of the Bohemian Designer series papers and matching card. The Cardstock I've used is Bermuda Bay, Very Vanilla, Basic Black, Island Indigo and Blackberry Bliss. Here's a closeup. I've used both framelits of Butterfly thinlits and Bold Butterfly to cut a layer my butterfly and Rhinestones down the body. The Banner punch was used on the Patterned paper and Blackberry bliss mat and the Spring Flowers embossing folder was used on the Basic Black background. I've used the Teeny Tiny sentiments for the greeting. Here's the full pic of the card. I have just a couple more cards to show you from my Christmas in July card class. A sneak peek of these were shown on my Blog post for the Stamp Ink Paper challenge. I wanted to show you these ones up close. The greeting on the first one comes from the Wonderous Wreath stamp set and its cut out with the Lots of Labels framelits. The little bird comes from the Festival of trees stamp set. The patterned paper comes from the new Christmas pack here called Merry Moments and I've used the new Banner punch to flag the ends. The next one here uses the Hardwood background stamp stamped in Soft Suede ink combined with the Wonderous Wereath bundle and a greeting from the Teeny Tiny sentiments stamp set. The inks used for greetings and wreath were Real Red, Old Olive and Pear Pizzazz. Here's a picture of both of my cards side by side. Awesomely Artistic Thinking of You card. I hope you've had a great Thursday. Its been another cool one here and I for one will be happy when we're over this cold snap. I love the warmer weather. Today's card has been made with the stamp set Awesomely Artistic and features the floral image from the set and the dragonfly. Come and have a look. I've used neutrals for this card, Basic Black, Very Vanilla and Sahara Sand cardstock and inks of Memento Black and Tip Top Taupe. Tiny pearls have been added to some of the flower centres. The greeting comes from the stamp set Teeny Tiny Sentiments. The main image was cut with the Oval Collection framelits. Here is the full view of my card. I've also used Sahara Sand trim on the lower edge of my card. All the materials to make this card are available in our Stampin' Up Annual catalogue. Thanks for stopping by to see my card and please feel free to leave a comment. I do like your feedback. Welcome to our Wednesday Card Sketch challenge at the Paper Craft Crew. We hope you will join us and play along with this fabulous sketch this week. I've used the Timeless Elegance desginer papers combined with the Merry Everything stamp set and matching Note tag punch, Papillon Potpourri butterflies and one of the new Metallic doilies in silver. The cardstock used is Basic Gray, Very Vanilla and Basic Black. I added a little Sahara sand lace to the back of my tag and one of the new pearls. For more information on this week's challenge and to see more inspiration from our team please visit the Paper Craft Crew for details.